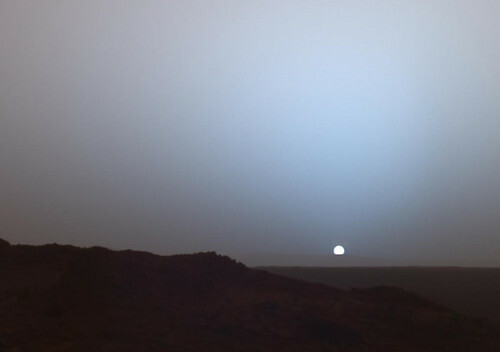 Sunset on Mars, originally uploaded by markaudette28. Yep. 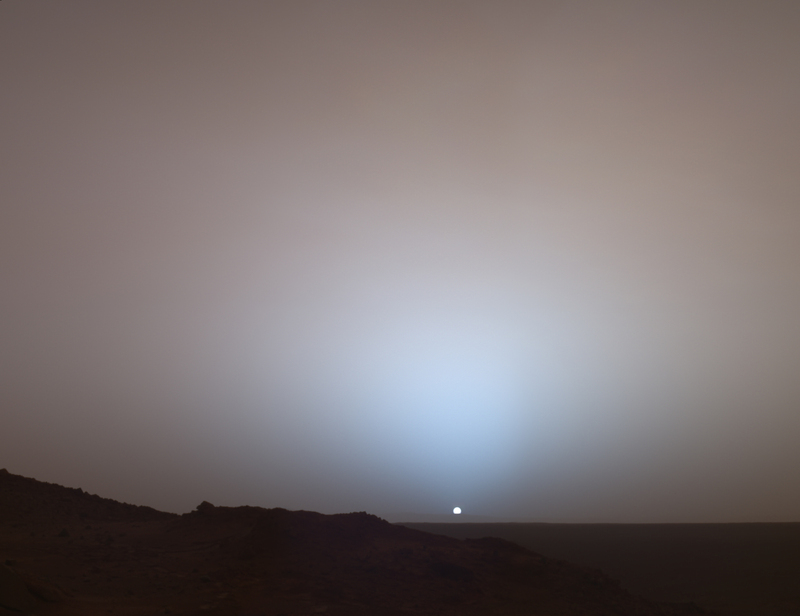 They actually have a picture of a sunset on Mars taken by the rover Spirit - a little guy that looks like WALL-E with wings and a neck. If you missed this bit of news, the picture was taken nearly five years ago. That doesn’t diminish the awe of it.It stirs me to my childhood growing up in Houston thinking I will be an Astronaut when i grow up. We all thought that down there, because we were inundated by the Space Program and NASA was literally in our backyard. There are things that we hear about, imagine, think about in the abstract and never give much thought to their tangibility. I used to wonder what the sky looked like on the Southern side of the globe until 2002. I sat on my deck one night looking up into the unfamiliar star-filled sky and felt the weight of the 10,000 miles between New Zealand and home. It was a bit terrifying, actually, and awesome. So, when I see an actual sunset pic taken from a day’s end on Mars’ surface… I get that same sense of awe and terrifying comfort. Maybe it’s that for the first time in the history of man, we actually have an idea of what it looks like to end a day on another planet. Maybe it’s that for all the beauty and wonder that we all have when we watch the sun set from our spot on the planet, there’s another spot… on another planet that stirs similar wonder and beauty – and we have the pictures to prove it. Or maybe it’s that this picture speaks not to our insignificance but that the Creator of the Universe is so big and cool that he has a thing for sunsets in any context; and if he has a thing for sunsets on Mars in their simple beauty, then maybe he has a thing for all the complexities I encounter in the flash of a moment on a daily basis.